Looking for a healthy 100% organic way to keep your skin glowing and moisturized? Nina Bella Collection Organic Body Butter is 100% organic, made from 100% certified organic ingredients, paraben, phthalate-free and petrolatum free. Made from organic certified cocoa butter, shea butter, coconut butter, palm oil and coconut oil, Nina Bella Collection Organic Body Butter addresses all your skin care needs. Ingredients: *Organic Cocoa Butter, *Organic Shea Butter, *Organic Coconut Butter, *Organic Palm Oil,*Organic Jojoba Oil,*Organic Rosemary Oil,*Organic Essential Oils, *Organic Glycerine. Unique combination of antioxidant-rich, vitamin rich, organic certified ingredients, nourish, protect and moisturize skin, preventing and minimizing environmental damage. A single use will leave your skin supple, smooth, toned, moisturized and touchable. Cocoa butter moisturizers and deodorizes skin with natural chocolate scent, organic coconut butter and palm oil create protective barrier over skin to prevent moisture loss, organic jojoba oil nourishes and prevents dryness, while organic essential oils deliver targeted care when and where needed. Preserved organically by anti-oxidizing and anti-bacterial properties of organic rosemary and grapefruit oils, Nina Bella Organic Body Butter is long lasting and 100% free of common industrial preservatives. You can choose from two delectable flavors: chocolate and chocolate orange. For us chocolate lovers, Chocolate Body Butter is the obvious choice. It does not have organic essential oils and feels decadent and chocolaty when rubbed into skin. Chocolate Orange Body Butter has organic essential sweet orange oil to smooth wrinkles and stimulate collagen production keeping your skin toned and fresh. Combination of chocolate and freshly squeeze orange, will make you ready to take your day energize and head on. 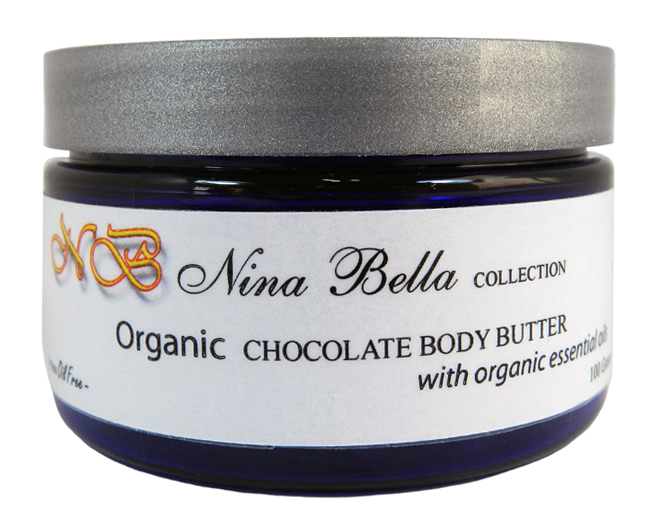 Nina Bella Collection Organic Body Butters – 100% organic, 100% real and 100% the best care for your skin. Try them today! !